Pink Ribbon Pin-ups | Purchase a 'Pink Ribbon Pin-Ups 2013 calendar in support of the Canadian Breast Cancer Foundation! 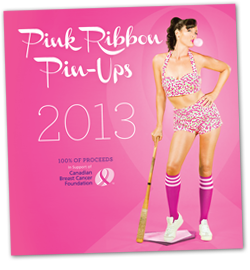 Purchase a 'Pink Ribbon Pin-Ups 2013 calendar in support of the Canadian Breast Cancer Foundation! Pink Ribbon Pin-Ups is a vintage pin-up girl calendar where all models are women living with, or who have survived breast cancer. The calendar was founded in order to bring awareness to the community, promote healthy body image and, most importantly, provide a space in which women can embrace their femininity, either during or after treatment. 100% of the proceeds of the calendar will support the Canadian Breast Cancer Foundation. Thank you to Canada Safeway for selling over 10,000 calendars in the month of October and raising nearly $85,000 on behalf of Pink Ribbon Pin-Ups for the CBCF! Calendars are now available for sale online for only $10 here! Please help us continue to spread our message and raise funds for the CBCF!